TAKEDA Nobutora visits Sunpu and is invited to renga no kai by his son-in-law IMAGAWA Yoshimoto. 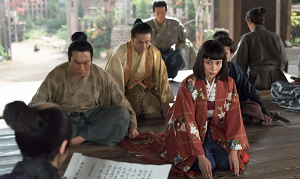 It's a meeting in which some people make renga, a kind of poem and Yoshimoto makes a verse that suggests someone leaves Kai and never returns to there. Nobutora thinks it means Harunobu but in reality it means Nobutora for Yoshimoto knows the plan of Harunobu by his letter. IHARA Yukimasa hears that Kansuke accepts the offer of Yoshimoto and visits him. He tells him that he will be a sacrificed piece of Yoshimoto but this is a chance in a million to him regarding taking revenge for Mitsu and serving the Imagawas. Then AOKI Daizen appears. He is eager to take the head of Nobutora and serve the Imagawas but Kansuke says he won't kill him. His words does not only to keep Daizen in check but to contain himself also. And he is called to Sunpu and told he should welcome Nobutora in tidy fashion and is given an eye patch made of leather. In Kai, the meeting of Harunobu, Nobushige and their vassals is in a tangle. MOROZUMI Toradsada, moriyaku (tutor) of Nobushige hesitates to accept Harunobu’s succession for he hopes that of Nobushige in reality. OYAMADA Nobuari who keeps calm stands up suddenly and opens the sliding doors to show them many vassals wait in next rooms. Nobuari knows what Harunobu thinks through the good offices of Taigen Sessai who serves Yoshimoto and knows him well. Nobuari asks Harunobu whether he compels Nobushige to accept his succession or not. Harunobu bows to and persuades Nobushige to accept it but he understands what his eider brother thinks though he is favoured by Nobutora. Then they arm themselves and depart for the borders on Kai and Suruga. Oi Fujin, mother of Harunobu and Nobushige decides to become a nun. At that time, HOJO Nobutsuna who is ill in bed makes his son Ujiyasu succeed the Hojos. Ujiyasu reads aloud the family precepts how the Hojos' samurais should be and it overlaps Nobutora on the way to Kai. But he sees his sons and vassals who prevent him from entering his province at the fort on the border. However those who accompany him strive to be the first to enter when the gate is opened. Harunobu announces that he cannot return to Kai any more. Though Nobutora, being flurries and orders ITAGAKI NObukata to kill him but the vassals never obey him. At last Nobushige persuades him and he realises that he should turn back the way he has come. Then Kansuke, Yukimasa, Daizen and other samurais come to guide him. Kansuke abandons his leather eye patch and wears his straw one made by Mitsu. On their way, Nobutora tells Kansuke that he feels a blood lust from him. 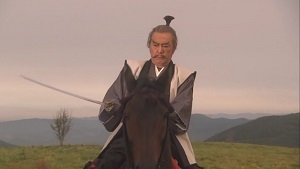 Then he makes his horse run to the field and Kansuke chases him. The memory of Mitsu come back. They cross swords each other but Daizen rushes into and Nobutora is injured and falls from his horse. Kansuke makes other samurais stop him and approaches Nobutora. He speaks to him that his son Harunobu will rule Kai well, contrary to his real intention. They return to Sunpu at dusk. The images are from the DVD series of "Furin Kazan". SETO Hokyu finds a buyer of the logs. It's a merchant whose shop name is Narikawaya and his logs were consumed by fire. Naotora tells Hokyu to sell them at a high price. At the same time, bucket-shops of salt trade with Kai becomes to be controlled strictly because IMAGAWA Ujizane prohibited it. This situation makes some merchants give up their business in Sunpu and move to Kiga. Naotora brands logs with a red-hot iron by herself and invites children at Ryotanji Temple to help her. Toramatsu, who considers why he lost the game of go is drawn to them also. After that she and her vassals visit Nakamuraya Yodayu in Kiga and talk over their dinner influenced by the Western and Chinese foods. Yodayu says that he sometimes mediate between merchants and Ryuunmaru who started their business that undertakes various kinds of works. And he learns that Naotora is in charge of shipping the Iis' log at a lumberyard. On the other hand, ONO Tajimanokami Masatsugu visits Sunpu and knows that Ujizane is going to build a castle in Kiga though the town is managed by merchants. Ujizane plans to control them (*). Then his vassal appears and tells him that somebody trades with his enemy TOKUGAWA Ieyasu (**) is found out. In ii-no-ya, people dye cotton cloth but Naotora thinks it needs to sale them in another way if Ujizane plans to build a castle in Kiga. At that time, Masatsugu returns to Ii-no-ya with SEKIGUCHI Ujitsune, senior vassal of Ujizane. He tells Naotora and her vassals that the Iis trade logs with Ieyasu and she realises that she was deceived but takes a low profile to him on this issue. Then both Naotora and Masatsugu considers how they should do. Natsu offers Masatsugu to help him but he refuses. Naotora decides to show off her fidelity to Ujizane who wants to make her obey him and departs for Kiga on the following day. She plans to buy all logs and then brands the logs and shows Ujizane them to prove there is no secret trade with Ieyasu. But there are not enough logs in Kiga. Then she ask Ryuunmaru to take back logs from Narikawaya. Besides she take a medicine to make her become feverish. Masatsugu visits her from Sunpu to confirm it and Naotora tells him it's a trick to gain time.While Naotora is delirious, Ryuunmaru and his fellows chase the ship of Narikawaya and take back the logs of the Iis. 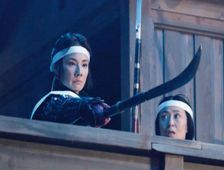 In Sunpu, Naotora meets Ujizane for the first time in twenty years and insists that she never betray him. At that moment, logs are brought into the residence of the Imagawas. （*）On the folowing year, ODA Nobunaga forced Sakai that was managed by merchants to give in. (**) Around this time he obtained the consent of the Imperial court and changed his family name Matsudaira to Tokugawa. OBU Toramasa was one of the vassals of TAKEDA Nobutora and Harunobu (Shingen). He is said to have been born in 1504. His younger brother (or nephew) Masakage also served the Takedas. In 1541, senior vassals of Takedas including ITAGAKI Nobukata, AMARI Torayasu and him cooperated Harunobu and exiled Nobutora to Suruga. After that he supported Harunobu well and became a premier leader of the Takeda army after the death of Nobukata and Torayasu. He also became a moriyaku (tutor) of Yoshinobu, heir of Harunobu. But the relationship between Harunobu and Yoshinobu worsend regarding the negotiation with the Imagawas. Yoshinobu took the side of the Imagawas for his wife is a daughter of Imagawa Yoshimoto. At last Yoshinobu was confined and Toramasa took the responsibility on himself and committed harakiri in 1565. His death made the Obu clan die out. Then Masakage inherited the Yamagata family and called himself YAMAGATA Masakage. The military unit of the Obus wore red armours called "akazonae" and the Iis or SANADA Nobushige (Yukimura) made their armours modeled on them. In this series, he is described as a calm and thoughtful man but distinguishes himself in battles. 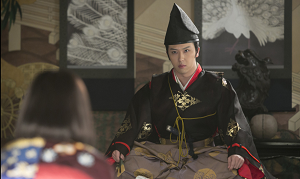 He understands Kansuke but becomes to oppose him for he backs SUWA Katsuyori, son of Yu-u hime as heir of the Takedas. ISHIDA Mitsunari is told to be confined but the administration without him doesn't go well. In February 1599, he makes a comeback. Nei decides to become a nun so Kiri, who serves Nei is going to serve the Hosokawas. 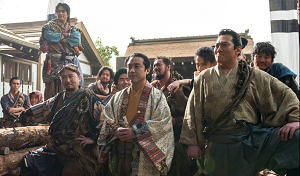 In the next month, leading figure MADA Toshiie dies and it encouragws those who are against Mitsunari and finally TOKUGAWA Ieyasu orders him to retire from his position. Then he departs for Sawayama Castle in his fief. After that Ieyasu enters Fushimi Castle and tells Nobushige to serve him but he refuses it. Ieyasu, the actual governor of Japan now gives notice to UESUGI Kagekatsu who is suspected to rebel against him. But his vassal NAOE Kanetsugu sends a letter calld Naoejo, that says the rumour of rebellion is not true and the Uesugis are busy with building castle town in Aizu. It makes Ieyasu unsatisfied and he decides to attack Kagekatsu. SANADA Masayuki receives a letter from the Uesugis that asks him to fight against Ieyasu together. On the other hand, Ieyasu asks Chacha for some amount of money. Besides he asks her to permit him the use of the Toyotomis' battle flags to justify his attack to the Uesugis. Though Okura-kyo no Tsubone opposes, Chacha permits it. After he marched to the East, some daimyos as UKITA Hideie, KOBAYAKAWA Hideaki and KATAGIRI Katsumoto discuss to defeat Ieyasu. Women of the Sanadas leave Osaka to avoid the war in the near future. Ina, wife of SANADA Nobuyuki who is a daughter of HONDA Tadakatsu, vassal of Ieyasu promises her husband not to communicate with her father secretly. In Osaka, the daimyos includes ISHIDA Mitsunari prepare for the war against the Tokugawas. But KOBAYAKA Hideaki is tired of fighting and is told by his vassal ITABEOKA Kosetusai, who is a spy in reality how to behave during the war. In July 1600, Fushimi Castle is attacked and it triggers the series of battles related to the Battle of Sekigahara. OTANI Yoshitsugu writes to the daimyos who still cannot decide which side they should take and suggest them that they should support ISHIDA Mitsunari. As his illness prevents him from writing letters, Mitsunari assists him and finishes it. 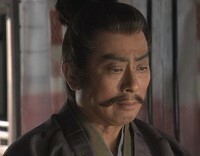 SANADA Masayuki receives it and is shocked at the rash act of Mitsunari that makes his plan disturbed. 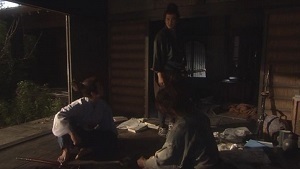 That night Masayuki, Nobuyuki and Nobushige talk about how they should do at Inubushi where their camp is established. Masayuki hopes the return of trubulous times but it's impossible after the unifitication of whole country by ODA Nobunaga and TOYOTOMI Hideyoshi. 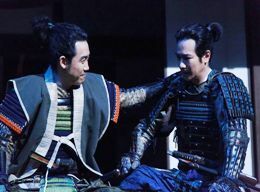 Nobuyuki says that he will take the sides of Ieyasu for his father-in-law is HONDA Tadakatsu. Then Both Masayuki and Nobushige take the side of Mitsunari and winner(s) will help loser(s) as possible after the war (*). Nobuyuki left Inubushi and takes the side of Ieyasu while Masayuki and Nobushige meets Ina, Ko and their children. Ina hears that Nobuyuki took the side of Ieyasu and says it's characterestic of him. 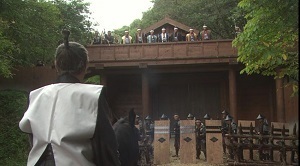 After that, Masayuki and Nobushige visit Numata Castle of Nobuyuki with vasssla but Ina and Ko never allow them to enter the castle because they are enemies. 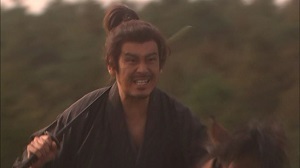 Masayuki smiles wryly and says that Nobuyuki has a good wife. TOKUGAWA Hidetada attacks Ueda Castle. Nobuyuki who communicates with his brother secretly and fights against him not seriously but in a set manner. In addition, the soldiers of the Sanadas confuse Hidetada's army and steal their rations. It keeps raining for several days and Kan River near Ueda has risen. 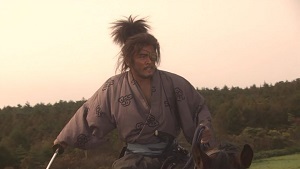 Hidetada is forced to retreat and marches to the west obeying the order of his father. "You should do your best before the war begins." And in Sekigahara, the battle of TOKUGAWA Ieyasu and ISHIDA Mitsunari is going to start but the Sanadas celebrate the victory and they suggest where the two armies meet. Then Sasuke comes in and tells them that the West army of Ishida Mitsunari was defeated and Mitsunari himself is missing. (*) This is called "Inubushi no wakare" (Parting at Inubushi), one of famous episodes in the history of the Sanadas. The images are from the official website of "Sanada Maru".